I'm posting this remotely. Our power is out and I hate being without power. No heat, no water, no internet. It's not civilized, I tell ya. So the kids and I are holed up at the Holiday Inn and I'm posting this from my laptop. Which is why I didn't use my regular watermark-I don't have it stored on this computer. Anyway Sammy and I made this for the girls at her dance class. Luckily there are only four kids in her class (including her) so we didn't have to make many. For the goodies, we put in a little stationary kit in a heart shaped box (walmart special) and an eraser. I didn't want to put candy in it-I prefer that people don't give my kids candy so I don't want to be a hypocrite and give their kids candy. Anyway I got the pattern for this from Andrea Walford's blog and it was so easy. Sammy cut the Hello Kitty shapes from the cricut and I helped her glue them together (she is RECKLESS with a bottle of glue-if I left her to do it by herself there would be glue on the top, bottom and sides of it. And since I use Tombow Mono Multi which dries tacky, that makes quite a mess.) So anyway we thought they came out pretty cute. that is a great bag! I love the Hello Kitty! Great job! How adorable!!! When I saw the hello kitty in the photo on my follower list, I knew it was Gale's!! I hope that your power comes on soon. That really stinks! This is just darling! I ADORE The Kitty! wonderful! How Cute!! i love the patterned paper and the border you made. 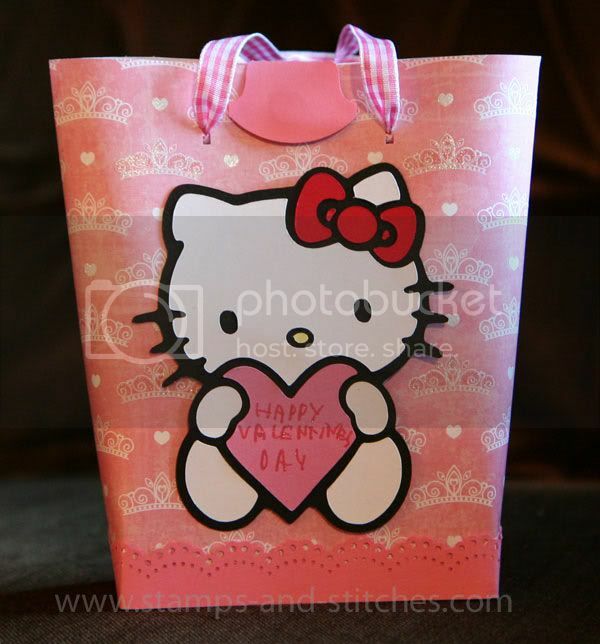 What a perfect Hello Kitty image for Valentines day. How cute! So nice of you to give such a gift to those kids! What a super cute Valentine! I'm sure they did love them, this is absolutely adorable!! Great idea on the stationary instead of candy...I need to purge my house today from the amount of candy flying around here after this Valentine's Day, consequently, my daughter is flying around here too! This is too cool Gale, just fab!!!! The Hello Kitty bags are so cute! I love the lace at the bottom. This is too cute! What a great project to let the kids help with! This is a great valentine, and I know what you mean about the candy. We allow it once in a while as a treat (we still have Easter candy from last year in a jar hidden in the cabinet that we use for occassional treats), and you should see the amount my kids got this year, it's unreal. I love this little bag! OOO It is so Cute My Niece would have a FIT!! Very cute and very fancy. Good thing the class is small. I know they must have adored this, and their Mom's too.